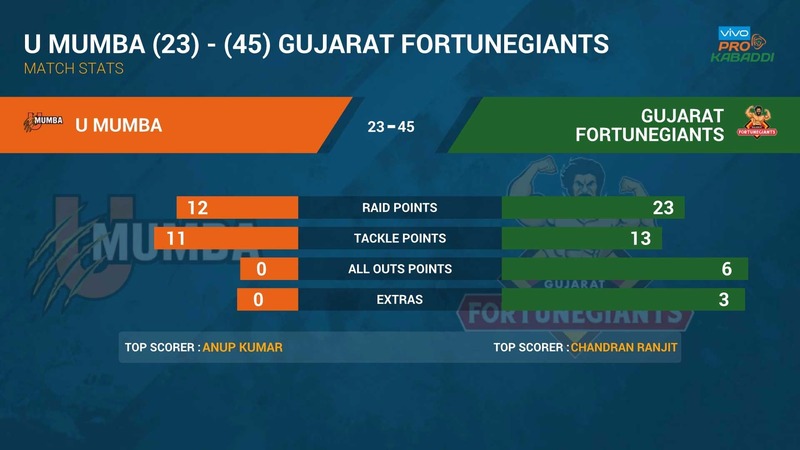 Zone A leaders Gujarat Fortunegiants routed U Mumba with a 45-23 scoreline at the Harivansh Tana Bhagat Indoor Stadium in Ranchi on Wednesday. 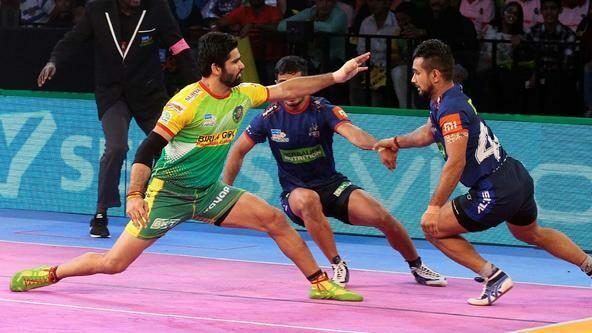 Chandran Ranjit (11 points in total) and Sachin’s Super-10 performances coupled with Fazel Atrachali’s High 5 (total 6 points) trounced the U Mumba brigade. Gujarat started with flair picking up four consecutive raid points to make their intent clear. In the absence of Sukesh Hegde, Atrachali was given Gujarat’s captaincy reins and he steered the team well. Mumbai, however, were not to be written off and answered with two super tackles to lead 9-7 after the first quarter. The second quarter, however, was a complete Gujarat show. Ranjit pulled off a super raid that soon handed U Mumba their first All-Out of the match in the 11th minute. 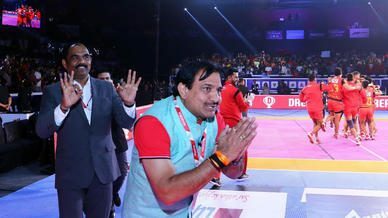 A brilliant display from Sachin and a couple of errors from the Mumbaikars led to the second All-Out of the night on U Mumba as Gujarat ended the first half leading 24-12. Trailing by 12 points, U Mumba started the second half holding a high line of defence and attacking only in do-or-die raids. This defensive approach helped them in pulling off two super tackles on Gujarat but the latter’s attack and defence both were on fire. 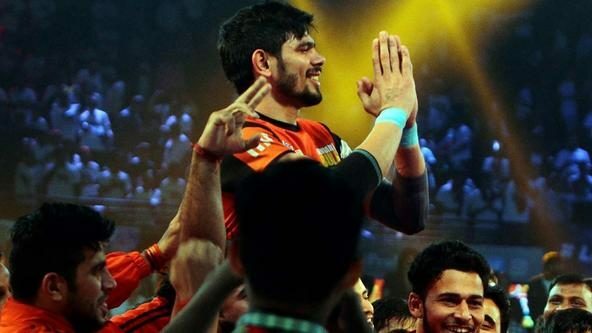 In the 34th minute, U Mumba faced their third All-Out of the night as Ranjit took out the remaining two defenders off the court to complete his first VIVO Pro Kabaddi Super 10. Sachin and Atrachali completed their Super 10 and High 5 respectively a minute later to pile on the agony for U Mumba. 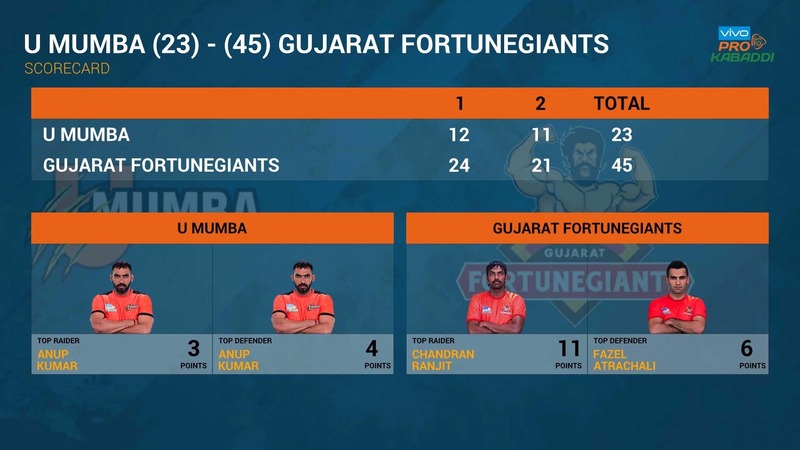 The curtains came down with Gujarat winning with a 22-point margin to keep their undefeated record against U Mumba intact. Check out our snapshots from this match here. 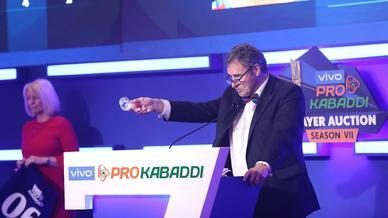 © Copyright Pro Kabaddi 2018. All rights reserved.